It was a flash in the pan that changed the history of California, and of the world. The sparkling gold nugget that caught the eye of James W. Marshall as he tended a sawmill in the Sierra Nevada foothills in January 1848 set off a gold rush that drew more than 300,000 would-be prospectors the following year from the eastern U.S., South America, Europe, even China. They were known as the 49ers. Today you can still pan for gold—it’s often said there’s more left in the ground than the original 49ers ever took out—but you can also raft some of California’s frothiest rivers, explore caverns and sample Chardonnay and Syrah in a number of uncrowded, up-and-coming wineries. 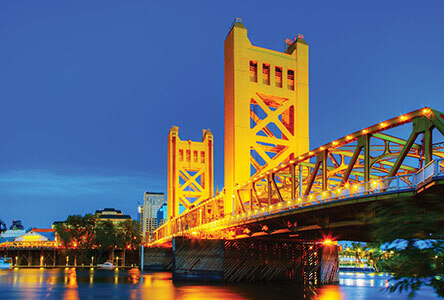 Sacramento was the terminus of the Transcontinental Railroad—from there, passengers completed their journey to San Francisco by ferry and barge—and the city still plays a vital role as the jumping-off point for exploring the Gold Country. Since the arrival of the 49ers, the small towns of the Gold Country proper have morphed through several distinct stages, from rough-and-tumble boomtowns, to somnolent hamlets, to destinations for biker rallies, to, finally, genteel venues for weekend getaways sporting comfortable B&Bs, sophisticated restaurants, antique stores and nearby wineries. Among the most popular are Sutter Creek, Nevada City and Murphys. The two largest towns of the Sierra foothills—Sonora and Placerville—offer all this, plus a large selection of motels, restaurants and shops in all price categories. From May to mid October, the American River is California’s top venue for whitewater rafting. The river flow is controlled by releases from upstream reservoirs, so rafters are assured of good conditions. Outfitters offer both half-day and full-day trips through Class III whitewater, ending up at Marshall Gold Discovery State Historic Park or Folsom Lake. In the northern Sierra, the town of Downieville has become a center for mountain biking. Local bike shops offer rentals and shuttles on old mining roads and single tracks from the casual to the technical, including a 15-mile ride with a 4,000-foot descent. Houseboaters flock to vast, sprawling Gold Country reservoirs such as New Melones Lake, Don Pedro Lake and Lake McClure.